Northwestern's Makenzie Fink, left, uses her head to make a block against Rocky Mountain while her teammate Bekah Horstman is seen in action during a pool match Thursday at the NAIA Women's Volleyball National Championship at the Tyson Events Center. Dordt's Julia Lindbergh, left, and The Master's Madi Fay are seen in action during a pool match Thursday at the NAIA Women's Volleyball National Championship. SIOUX CITY -- After a convincing win in the first set No. 1 Grand View looked to be on its way to an easy trip to the semifinals but Viterbo regrouped and won the next three sets to end the Vikings' unbeaten run Friday evening. Game scores were 15-25, 25-20, 25-19, 25-19. Lydia Xu had a match-high 18 kills to lead Viterbo (32-7), which will move on to face Columbia (Mo.) in a semifinal contest Saturday. Katie Frohmader had nine kills and Lauryn Sobasky 27 assists for the V-Hawks. After committing just three attack errors in the opening-set win, the Vikings struggled the rest of the way, making 22 errors on the attack over the final three sets. Courtney Twit had a dozen kills and Meagan Miller added 11 for the Vikings, who end their season with a 35-1 record. Columbia also moved on with a four-set win over Dordt in another quarterfinal. VITERBO 3, NORTHWESTERN 0: Lydia Xu and Aubrey Aspen each recorded nine kills with respective hitting percentages of .500 and .353 while leading seventh-seeded Viterbo to a 25-13, 25-17, 25-21 Round of 16 win over eighth-seeded Northwestern. Setters Lauryn Sobasky dished 14 assists for Viterbo (32-7), three more than teammate Chloe Jakscht. Sobasky and Rachel Frankowski each provided eight digs while coming through with two blocks each were Miah Garant, Aspen and Katie Frohmander. Lauryn Hilger, the Great Plains Athletic Conference’s leader with an average of 4.57 kills per game, hit .321 while leading Northwestern (26-9) with a match-high 13 kills while adding seven digs and two block assists. Makenzie Fink provided seven kills and three ace serves. Lacey Wacker recorded 24 assists and seven digs for Northwestern, which reached the Round of 16 for a second straight year. Bekah Horstman had one solo block and two block assists. GRAND VIEW 3, WESTMONT 1: Kelsey Redmond provided 22 kills and four block assists as No. 1-seeded Grand View clipped Westmont 25-19, 25-22, 26-28, 25-15. Meagan Miller supplied 12 kills, 16 digs, two ace serves, one solo block and one block assist for Grand View (36-0) while Miranda Greathouse had 10 kills, 11 digs, one solo block and two block assists. Courtney Twit delivered 10 kills while setter Trystin Luneckas had 48 assists. Cassidy Rea pounded 15 kills for Westmont (27-7) while double-digit kill totals also came from Libby Dahlberg (13), Samantha Neely (12) and Hali Galloway (11). Setter Amy Buffham had 51 assists while Lauren Friis recorded 21 digs. COLUMBIA 3, HASTINGS 0: Caroline Clifford supplied 10 kills, seven digs and four ace serves as No. 3-seeded Columbia stormed into the quarterfinals with a 25-12, 25-8, 25-14 sweep over Hastings. Kiersten Anderson delivered nine kills and three ace serves for Columbia (40-4), which won by sweep for the second time in the last three days at the Tyson Events Center. Maria Sandoval had nine kills and nine digs while setter Manuela Vargas dished 28 assists. Hastings (22-7) became the second GPAC school to become eliminated in the Round of 16. Matti Dabovich and Emily Lenners each recorded four kills for the Broncos while setter Clare Hamburger finished with 10 assists. Casey Krolikowski had eight digs for a program which fell in the Round of 16 for the second straight year. DORDT 3, EASTERN OREGON 1: Outside of top-seeded and undefeated Grand View, the NAIA Volleyball Championship’s other red-hot team is No. 5 seed Dordt, which received 21 kills and 16 digs from Ema Altena in the squad’s 25th consecutive victory, topping Eastern Oregon 23-25, 25-15, 25-13, 25-19 en route to the quarterfinals. Setter Jamie Altena (59 assists, 18 digs) directed an offense that hit .314. Leah Kamp recorded 13 kills for GPAC champion Dordt (30-2) while Ally Krommendyk and Julia Lindbergh each added 12. Libero Aubrey Drake had a match-high 27 digs. Megan Bunn paced Eastern Oregon (25-8) with 12 kills. Setters Madison Pilon and Sarah Carpenter recorded 22 and 17 assists, respectively, while Kiley McMurtrey ended with 21 digs. SOUTHERN OREGON 3, ROCKY MOUNTAIN 1: Nila Lukens’ match-high 18 kills propelled Southern Oregon into its first-ever NAIA Volleyball Championship quarterfinal appearance following a 25-23, 19-25, 25-22, 25-17 victory over ninth-seeded Rocky Mountain. Tenth-seeded Southern Oregon (28-4) received double-digit dig totals from Taylor Ristvedt (13), Malie Rube (12) and Makayla Hoyt (10). Setters Natalie James and Hannah Bogatin dished 34 and 18 assists, respectively. Kiley Barcroft had a match-high 22 digs. Daniella Russell pounded 16 kills for Rocky Mountain (30-6), which last reached the quarterfinals in 2014. Hailey Copinga and Olivia L’Ami added 13 and 11 kills, respectively, while setter Natalie Hilderman had 44 assists. Ruby Kallenbeck had 17 digs, one more than Copinga. PARK 3, COLLEGE OF IDAHO 1: Nada Meawad pounded 20 kills as second-seeded Park reached the quarterfinals for the fourth time in the last five years following a 25-18, 25-20, 23-25, 25-19 win over College of Idaho. Noura Meawad contributed 15 kills and 12 digs for Park (33-1) while Alissa Flint had 12 kills. Setter Danna Gomes dished 55 assists while Celina Monteiro had 21 digs. Mali Sawyer had 14 kills for College of Idaho (24-10), one more than Taylor Anderson. Setter Marija Djonovic had 50 assists while both Drew Dobney and Ashley Pagan had 20 digs. LINDSEY WILSON 3, CORBAN 0: Sarah Cruz pounded 13 kills for No. 6 Lindsey Wilson, which posted a 25-16, 25-20, 25-21 win over Corban Friday afternoon. Grace Blomstedt, a 6-foot-3 middle blocker from Red Oak, Iowa, added eight kills for defending national champion Lindsey Wilson (33-3), a program which reached the quarterfinals for the fourth straight year. Setter Autumn Proctor dished 30 assists while Lilo Larzelere had 15 kills. Adriana Aguayo delivered 10 kills for Corban (22-13), a three-time national qualifier which was playing in the Round of 16 for the first time ever. Setters Cierra Leopoldino and Jadyn Mullen had 15 and 14 assists, respectively, while Kealani Ontai had 11 digs. MIDLAND 3, MISSOURI BAPTIST 1: Priscilla O’Dowd hit an outstanding .474, pounding 19 kills as Midland advanced to the quarterfinals following a 25-23, 22-25, 25-17, 25-18 win over No. 4 Missouri Baptist. Midland (25-7), the No. 14 seed, reached the quarterfinals for the first time since 2016, the year it reached the Final Four. Setter Jessica Peters dished 45 assists while Jaisa Russell had 18 digs. Mallory Moran smacked a match-high 21 kills for Missouri Baptist (33-6), a semifinalist a year ago. Ana Oliveira had 11 kills, setter Megan Huffman had 34 assists while Rachel Luedders had 22 digs. NORTHWESTERN 3, ROCKY MOUNTAIN 0: The Raiders needed a win to secure a berth to advance out of pool play and handed the Bears their first match loss in Sioux City 25-18, 25-14, 25-17 Thursday evening. Northwestern got 14 kills apiece from Makenzie Fink and Emily Van Ginkel and 13 more from Lauryn Hilger as it controlled play to move to 26-8 on the season. Rocky Mountain got just 23 kills as a team in the match and fell to 30-5 on the season but will also move on to first round play. 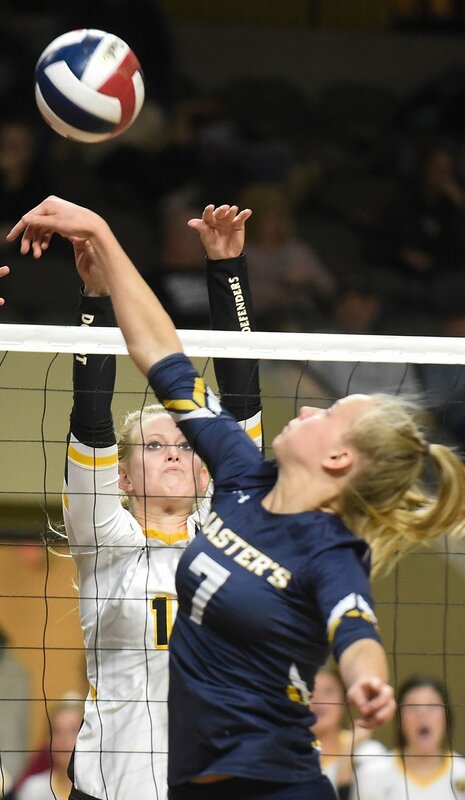 DORDT 3, THE MASTER’S 1: The fifth-ranked Dordt volleyball team defeated No. 12 The Master’s 22-25, 29-27, 25-16, 25-12 in pool play on Thursday at the NAIA Volleyball Championship on Thursday in Sioux City. Ema Altena finished with 15 kills for Dordt (30-2). Jessi De Jager and Leah Kamp both recorded 12 kills and Ally Krommendyk had 10. Jamie De Jager dished out 46 assists and added 14 digs. Aubrey Drake notched 14 digs and Hannah Connelly added 10. Madi Fay tallied 11 kills for The Master’s (30-7). Kayla Sims dished out 20 assists and Sarah Park added 14. Dordt in the first round of the NAIA Volleyball Championship on Friday after pool play. PARK 3, WESTMONT 0: Alissa Flint and Nada Meawad each recorded nine kills while leading No. 2-seeded Park to a 25-14, 25-15, 25-10 sweep over Westmont to conclude Pool B action Thursday night. Noura Meawad and Paula de Oliveira each recorded seven kills for Park while setter Danna Gomes recorded 34 assists and 11 digs. Celina Monteiro had 17 digs while de Oliveria had two solo blocks and one block assist. Samantha Neely led Westmont with six kills while Amy Buffham dished 16 assists. Lauren Friis topped the defense with 12 digs. Dordt vs. Columbia NAIA volleyball action at Tyson Events Center in Sioux City, Iowa on Friday, Nov. 30, 2018. NAIA volleyball action at Tyson Events Center in Sioux City, Iowa on Thursday, Nov. 29, 2018. SIOUX CITY -- On paper, this was a titanic battle between two of the nation’s hardest hitting squads.